Consultation on changes to the Mobile Library Service, an EqualiTea discussion and more about what DCC are doing to celebrate the centenary of women first gaining a right to vote. We were joined by the manager of the Mobile Library and Outreach Service, Rachel Gee, from Libraries Unlimited (independent staff and community owned charity, established in April 2016 by Devon County Council). Libraries Unlimited are running a public consultation to help decide on the future shape of their mobile and outreach services. Their aim is to design services that meet the needs of even more people and encourage a wider range of people to make good use of library services. Rachel explained that usage of static and mobile libraries is changing. Static libraries now provide a greater range of digital and other services and act as vital community hubs through a programme of events and activities. Far fewer people now use the mobile library service and the number of mobile library loans has reduced from over 90,000 to 64,000 since 2014/15. The current service is provided from four mobile library vehicles which make 447 short stops across the county each month. The service currently has 3,193 users, a decrease of 21.43% from 2014/15 when more than 4,000 people were using the service. The current fleet of mobile vehicles used to deliver the service are now around 10 years old and have become increasingly unreliable and expensive to maintain. If this service is to continue, all vehicles will need to be replaced or updated at a cost of over £300,000. In addition, mobile libraries can offer only a limited service to users due to their size. Many more people now use mobile technology and the internet in their daily lives, including to access digital library services 24/7. There are also a range of alternatives being used in many other parts of the country that help meet the specific needs of rural communities, and particularly elderly, isolated and vulnerable people. Extended Home Library Service – This delivers books and audiobooks direct to people’s homes. It is intended for people who through ill health or disability cannot visit a library or are too frail to carry heavy books. This personal service could be extended to support more people who need it. Help with Transport – Working with local community transport providers to provide regular stops at town libraries to enable people from outlying villages to access the full range of library services and give access to local events and activities. Good Neighbour Scheme – This new type of membership would enable a friend, family member or neighbour to collect and return books on your behalf. Pop-up Community Libraries – Working in partnership with interested communities, a popup local library facility could be created using a local community venue (only suitable in larger rural communities). eBooks and online material – Invest in a wider range of eBooks, audiobooks and digital magazines and provide remote access to online material for all library card holders. Carry out an 'asset based survey' to find out what resources already exist in the voluntary and community sector and connect up more with voluntary/community organisations. For example, Living Options Devon has a mobile unit in north Devon and connections could be mutually beneficial. People need skills in using the internet, not just internet access. Women are biggest users so could be disadvantaged most of all: 64% are women. 75% are aged 55 and over. Older women are less likely to be drivers and internet users. They could be a key target group for questions about alternatives such as good neighbour scheme. See if pop-up community libraries are eligible for Big Lottery Loneliness Fund. Churches and religious centres - could offer space. People need to know that library services are for them. Create posters to advertise books available in other languages. Scope for engaging more with ethnic minority communities. How are you engaging Deaf people? Living Options Deaf project could offer views on proposals. Exhibitions at community events/spaces could be good way of promoting what libraries do. Capture data around book clubs as a way of tackling loneliness. The diversity questions in the survey could be better. Can we see the second questionnaire before it goes out? EqualiTeas is a government initiative set up as part of the Vote100 celebrations. 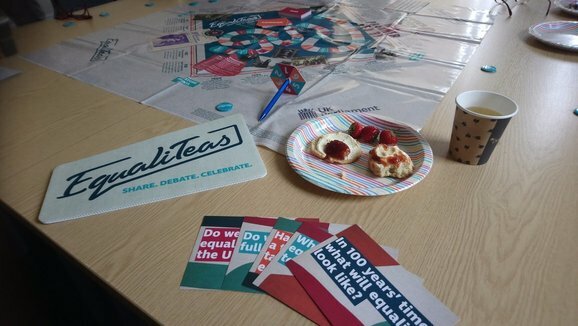 Many suffragettes used tea rooms to plot their next campaign, so in true suffrage style, we enjoyed a traditional Devon Cream Tea and sandwiches whilst we explored the history of women's suffrage through an EqualiTea board game. We learnt interesting facts about the suffrage movement such as the 1907 protest in London which became known as the Mud March because the weather was so bad; despite this 3,000 people attended, Young Hot Bloods was the name of a group of younger members of the WSPU, women were allowed to vote in local elections from 1894, and suffragette Edith Garrud taught campaigners the martial art Jujitsu. - a unanimous No! The Gender Pay Gap and number of women in senior positions is evidence of that. Not removing or using disabled parking bays for other purposes. Every person is able to achieve their own potential. Providing support to achieve a fair outcome - 'levelling the playing field'. Not making decisions based upon stereotypes. In 100 years' time what will equality look like? Some things won't be an issue, for example there will be more gender equality. It will play out in ICT/Digital communications far more. Don't think racism will go away. There will be greater income inequalities. Power will still remain with the elite/few. Is there a downside to equality? It can't be achieved fully. If you treat it as just about everyone having equal lives, rather than individual fairness/support/respect then it doesn't work. It depends where the level of equality is - if you treat everyone badly that's still equality. It should be aspirational too! It doesn't work if you hide behind policy and don't act. Should MPs reflect the diversity of the UK? Do we mean 'reflect' as in 'look like/live like' or 'be able to sufficiently represent diverse views'? It's more important for politicians to reflect diverse views and not self-interest. Should seek to reflect diverse characteristics, but that might not be fully achievable. There are currently too many barriers to social mobility in the UK for this to be achievable: need to remove barriers so that diverse people can participate and need more about politics taught in schools, learning to speak up etc. What can be done to encourage people today to use their hard-won vote? More about politics in schools. Politicians need to build trust. Break down the revolving door. More representation of ordinary people (issues with social mobility). Modernise voting - use ICT. The system is very outdated - we make it too hard. Devon County Council staff and Members can borrow the EqualiTea board game from the equality officer. 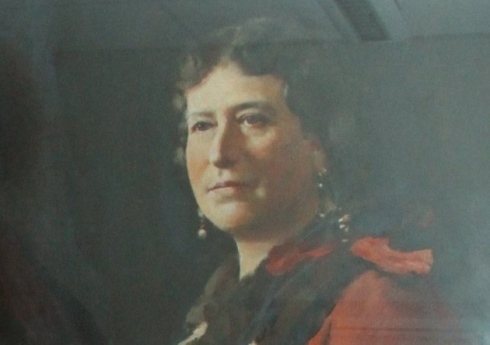 Councillor Caroline Chugg has been appointed as Chairwoman and in her address at the AGM in May she unveiled a portrait of Juanita Maxwell Phillips, Devon County Council's first woman Councillor. She also announced her intention of holding an event to celebrate women's achievements in Devon. The portrait is a copy of the one hanging in Honiton Town Hall. Friday 14th December – exciting events are being planned to mark 100 years since qualifying women over the age of 30 were able to cast their first vote. This will include an exhibition, youth takeover and 'conference with a difference' on women in public service. Council group Leaders have said they "will not tolerate any actions that leave staff feeling threatened, fearful or intimidated, or disrespected" after a cross-party Standards Committee issued a notice of public censure to Councillor Brian Greenslade following a formal complaint made against him regarding alleged sexual harassment and abuse of a number of female employees over a number of years. When this matter came to the attention of the Chief Executive Phil Norrey, he says: "the picture that emerged appeared so serious that I decided to lodge a formal complaint on behalf of those affected." A confidential helpline is available for staff. To complement the Equality Reference Group which is a body of external advisors, a Staff Diversity Reference Group has been formed to support people with protected characteristics to give DCC feedback on all areas relating to the Council's How We Work agenda. For instance, a recent review of one DCC building has shown that improvements can be made to help those with learning and other disabilities to access the work space. Where and when we work Workspace (including homeworking) and flexible working in practice. Interactions Information and communications, change management, feeling valued, equality and diversity training. Travel Public transport, car parking, pool cars, hire cars, essential users. Policies Sickness, parental leave and similar. We're thrilled that one of our members up for an award. The Heritage Ability team are part of Living Options Devon (disability representative on the ERG) and are finalists in the National Lottery Awards. They've made it to the final seven in the heritage category, and they need your help to win. If you think that accessibility matters, then vote with your heart. Or, call 0844 836 9700 (calls cost 5p, but please check with the bill payer or your network provider, as there may be additional charges).